Congratulations to Breaking Bad on their Emmy win tonight, but I'm hoping that next year they sweep the awards show because this second half of the fifth (and last!) season is amazing! Breaking Bad is one of the best television shows I've ever watched. If you're not watching it go catch up on Netflix and be prepared to watch an incredibly emotional, gripping, and, at times, painful to watch television show that manages to balance an incredibly dark character-driven drama with a slight touch of humor. All of the actors in this how are fantastic even if I hate the characters they play. Watching each episode (and the arc of the entire series) is like watching a Shakespearean or Greek tragedy, with extreme catharsis. 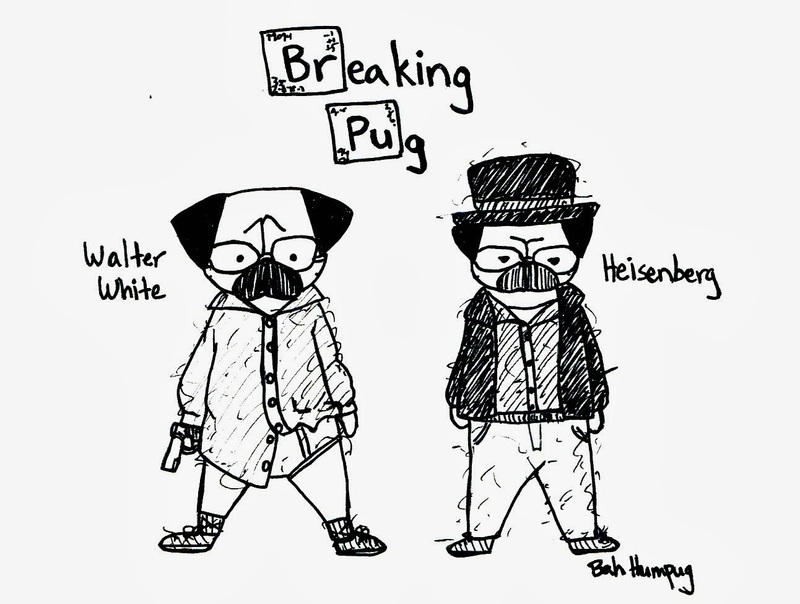 In honor of the show's last season and the upcoming series finale, here's a pug version of the transformation of Walter White into Heisenberg. Of course I had to add pug fur on the clothes because that's just a part of pug life. P.S. Between this show and Malcolm in the Middle, I've seen Bryan Cranston in his tighty whities way too many times. Omigosh, this is fabulous! Hope you sell this at your etsy shop. It would make a great t-shirt!